We first came across Rob and Marilyn Squire's Head-Over-Heels on the Bay at last July's Plastic Classic Regatta. At the Classic Head-Over-Heels won two medals in the Concourse d'Elegance; one for it's interior and one for its single handing set-up. Intrigued by this ever since, we went over to Alameda's Grand Marina on a rainy January morning to meet with Rob and find out more about Head-Over-Heels. "I think real reason we won the medals is that the judges liked our beer and laughed at my jokes", Rob said modestly as he showed me around the splendid interior. Rob opened the top to the ice box and said "it's actually a refrigerator. It has a Peltier Effect cooler that keeps it about 40 degrees in the summertime. It only draws about 1 amp." While it's not hard to imagine a committee from the Bay View Boat Club finding a boat with a real refrigerator filled with ice cold beer to be well appointed, that obviously was not the whole story. 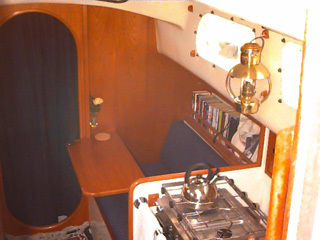 As the photos show, Head-Over-Heels main cabin has been meticulously redone. Rob continued giving me pointers on working the judges, "They also said that not only does a bookshelf have to be well built, it has to be filled with the right kind of books." 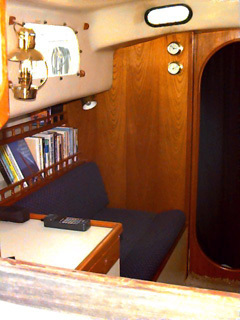 His bookshelf, left, is not only craftsmanship, it is properly filled with classic nautical reading. Rob keeps a photo album on board which documents the changes to Head-Over-Heels since he and Marilyn got her in 1991. "We found her lying in the mud in Point San Pablo", back when she was still "Grumpy". 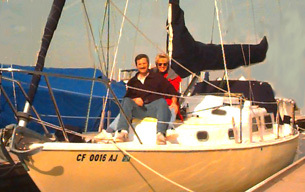 Rob almost didn't buy her, but did in the end because he "wanted a good, sound, affordable ocean boat. One I could put as much into as I could. The Triton was the right size boat to do it." Rob's photos of Grumpy showed a typical sad, long neglected boat. The first thing Rob did was to get the hull looking good again. 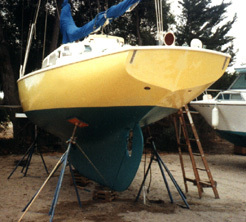 "When we brought the gel coat back to life, we first wet sanded the entire topsides with 600 grit. Then, using rubbing compound and a large power polisher, we polished out the surface to remove the scratches from sanding. After we were satisfied with the finish, we waxed and buffed to protect the gel coat from oxidation. The job took several days of standing on scaffolding and working the gel coat. The finish was well worth the time involved, as you can see from the pictures, and staved off an expensive paint job." According to Rob the sanding was an essential part. "The oxidation was in the pores of the gelcoat. The power polish alone wouldn't do it. The gelcoat layer on a Triton is quite thick and you only have to remove a thin layer with the sanding". 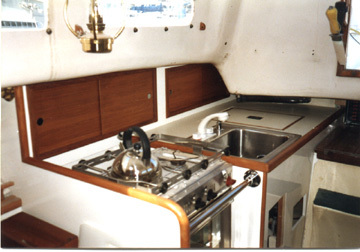 In order to add a stove and a real sink and counter, Rob started from scratch by ripping out the starboard bunk. The photos below take off from that point. Patterns were made to size things up. 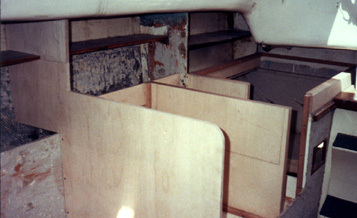 Cut pieces fitted up, the remains of the old sink and counter came out. Lots of work later, the finished product. "I hired someone to do the wooden molding. I didn't think I could do a good enough job." The sink, by the way, has hot running water. 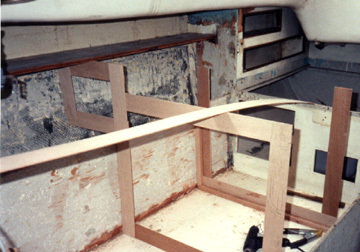 Another major interior job for Rob was to remove the old Atomic 4 and replaced it with a diesel. I asked him about one of my dark fears; removing bolts that have held down the engine for 30 years. "They came right out. I came prepared to cut them out but it turns out that the engine mount is wood that is attached to the hull with glass. The mounting bolts go into the wood." Good thing to know. Rob removed the engine in a single day with the help of a friend, a chain hoist and an all-purpose 4x4 and did the diesel installation work himself. Besides the interior work, Rob's also been busy on the deck. Remember, he and Marilyn also won an award for single-handed set up. He's added a pushpit which was built by Railmakers in Alameda. "They have patterns. I took a photo of the boat down there and picked one out I thought would look good." He has a new mast from Ballanger in Santa Cruz. "Ballanger builds it, fits it up and then takes it apart. The mast and boom cost about $4K." Rob's new mast has two main halyards, two jib halyards (all internal) and a solid vang that eliminates the need for a topping lift. "The renovation was done as sequential, major projects. 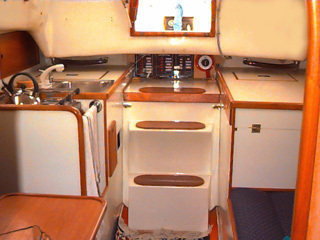 We sailed her most of the time while doing the major projects". And so, as the dreary January rain continued, I stood in the shelter of Rob's new dodger, admiring the workmanship of the seahood he'd installed over the slide hatch, regretting that we couldn't go out for a pleasant, sunny sail to try out the orderly arrangement of lines which come back to the cockpit and, perhaps, cook a snack on the propane barbeque mounted on the pushpit while the autopilot faithfully guided us on our way. Instead, I went to Dogstar and pumped rainwater out of the bilge.